Yesterday, as I made my way through the cafeteria line and piled two, three, four ears of corn on my tray, I found myself singing, "Corn is great. Corn makes me happy. Happy happy happy hap-peeee." Unfortunately, I was flanked by Koreans, who don't get as excited about corn on the cob as a Midwesterner does. And I was singing out loud. One of my favorite things to do with hap-peeee corn is to slice off the extra into a salad, into which I also dump beets, blue cheese, sometimes sunflower seeds, fresh herbs, raisins, mozzarella or bits of chicken. Then I spend the next thirty minutes chewing. oooh, like corn in my salad too. 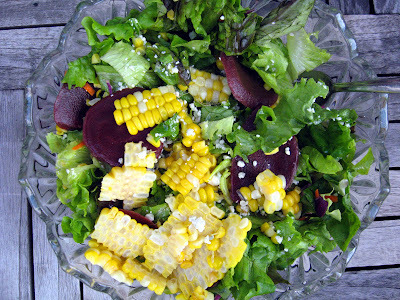 b and i recently had a mixed green salad w/roast beef, gorgonzola, and CORN and it was FABULOUS. i'll sing with you, "happeeeee, happpeeee, happeeee, corn makes me happppeeeee."